I don't know about you, but I have had an incredibly productive Sunday. I woke up around 7:30 and went for a nice, long run. I started working on the final paper for the last of my summer courses. I took a break from that to head to the bookstore to buy the new Harry Potter book (that was around 2). I came back, ate lunch, and continued to work on my paper. Once I reached the 20% mark, I set it aside. Don't laugh--at a whopping total required length of 20 pages, 20% in one day is pretty commendable. Man, after a day like today I wish I had a fire pit. Right about now I'd be piling wood onto it in preparation for a killer bonfire. I'd roast weenies, drink beer, and, for dessert, make s'mores. Do you know what I don't have? A fire pit. It's a perfectly fine summer day in a season that's been chock-full of perfectly fine summer days. Yet, I haven't had the chance to enjoy a single s'more. While, technically, Saranac's S'more Porter will not change that, here's hoping it gives me the whole s'more experience in a beer form! Over a year ago, I discussed Saranac's Goat Rodeo. I enjoyed that pale bock quite a bit and, at $4/sixer, the price was right. In that post, I discussed the fact that the family-owned brewery can be traced back to 1888 but that the Saranac beer name didn't come about until 1984, nearly a century later. Unfortunately, the brewery's Our Story page appears to be undergoing maintenance right now so I cannot link to more information on the brewery itself, but I can link you to the Community page on Saranac's website, which touches upon the numerous charity efforts the brewery backs. Believe it or not, S'more Porter is a seasonal, but probably not for the season you'd expect. According to information found on the brewery's Seasonal page, S'more is brewed for spring. So, although my daydreaming about s'mores over a summer night campfire are not, I think, unfounded, we'll go with spring. Further details about the porter, found on it's official webpage, inform us that it's brewed with four different malts and aged with chocolate and vanilla, which results in a decadent beverage that tastes like marshmallow, chocolate, and graham cracker. It also boasts an ABV of 6.2%. It certainly smells like milk chocolate and graham crackers. Rich and decadently sweet. Smokey, to boot. But I'm not getting much 'mallow from the aroma. Which, is fine. With the chocolate, graham, and smoke, I really get a whole s'mores vibe from the porter. Marshmallows optional. For what it's worth, Purrl loves this brew's aroma--she gave it a good eight consecutive whiffs (meaning, of course, that it's most likely a pretty good beer). That decadence carries through to the porter's flavor without fault. Throughout each swig there's a deep, rich chocolatiness that's surrounded by graham crackers on the front end and marshmallows behind. The finish is some unnameable sweetness while the aftertaste rings with graham. This is just like a boozy, liquid s'more, only if the s'more was made of the finest imported chocolate. The mouthfeel's on-par with what you'd expect from a porter. Full, foamy but not bubbly. Hell, decadent is an applicable adjective here, too. I've been to plenty of important bonfires in my life. 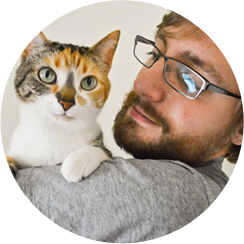 Well, at least ones I deem important. These were for graduations, communal gatherings, and meeting new friends or celebrating old ones. But S'more Porter doesn't remind me of any of those. What is does remind me of is any of the myriad of bonfires my family had during the summers when I was in high school. My mom or dad would randomly get the idea of having a bonfire into their heads. We'd go to the grocery store to stock up on graham crackers, chocolate, and marshmallows. Then, at sundown, we'd load up a wagon and trek it to the fire pit at the far end of my parent's property (we lived in the country). While we'd usually just roast and eat the 'mallows and eat the chocolate separately, every once in a while we'd make actual s'mores. They were gooey, messy, flavorful, and, most important of all, good. It was just my parents, my brother, and myself those nights. We'd sit around the fire, dodge the smoke, and gaze at the stars. Saranac's (a family brewery) S'more Porter makes me think of s'more-making evenings with my own family. 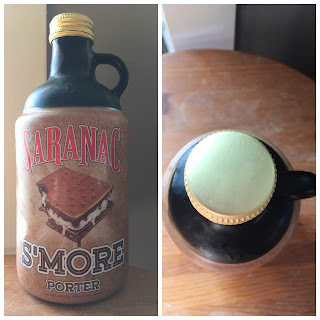 S'more Porter is a good beer and definitely the best offering from Saranac that I've had. Chocolatey, grahamy, marshmallowy, and decadent to it's core, you should pick it up if you're in a s'mores mood but, like me, don't have ready access to the necessities for making them. It gets an 8.5/10 from me. If you try it, let me know what you think!